Julia is an American STINTer that has come to Malaga for a year to work with the student team in that city, partnering with them in various projects and talking about Jesus with the young people. Julia met Anne Marie on campus and since then their friendship has grown. Julia wanted to share her story with Anne Marie here on the Agape blog, of how they starting talking about her faith and how Anne Marie wanted to do the same with her friends. 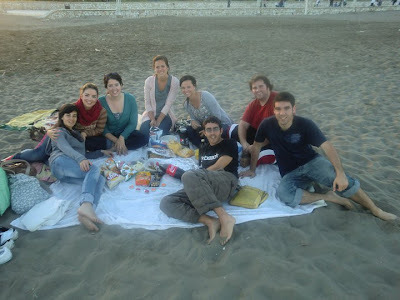 "My friend Anne Marie is a student from England that is studying in Málaga with the Erasmus program. Since I met her in October, it´s been a great blessing for me to see how the Lord has been touching her and influencing her heart. A pretty tragic and complicated situation in her family has caused her to search hard for God. Anne Marie and I meet once a week to pray and read the Bible together. A couple weeks ago when we were finishing our study she asked me if I could help her learn how to share her faith with her friends. I´m so grateful to have met Anne Marie and to have the opportunity to be here and to be able to accompany her on this faith journey and to share how to talk with others about who this Jesus is that has changed her life and her heart. I trust that the Lord is doing great things in her life and that she could be a woman of influence in the future for God´s kingdom." When you find something that is really good, it´s difficult to be quiet about it and not tell the whole world what you have found and how its changed your life. Without a doubt, Jesus has impacted the life of Anne Marie and she wants to tell everyone about it.